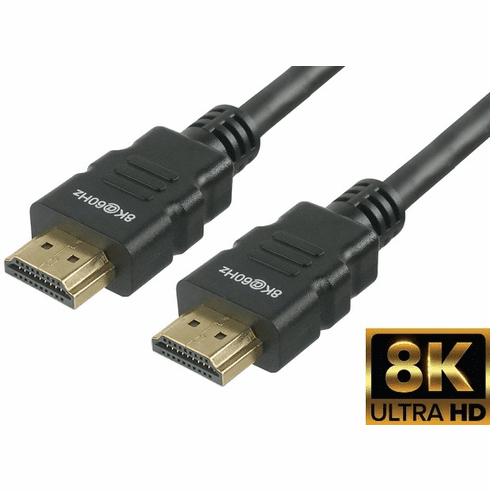 For high resolutions, Ultra High Speed HDMI cables deliver increased resolutions, such as 8K / 60Hz and 4K / 120Hz (* VESA DSC 1.2a link compression can be used to achieve resolutions above 8K60 / 4:2:0 / 10-bit color, such as 8K60 RGB, 8K120 and 10K120). Backwards compatible with previous HDMI versions, the bandwidth is increased to 48Gbps and includes support for Dynamic HDR and eARC. Dynamic HDR can adjust settings, such as brightness, color, depth, etc. based on particular scenes or frames, allowing video to be displayed at its optimal settings. eARC supports the latest audio formats (DTS Master, DTS:X, Dolby TrueHD, Dolby Atmos, etc. Note: High Speed HDMI cables will also support eARC).